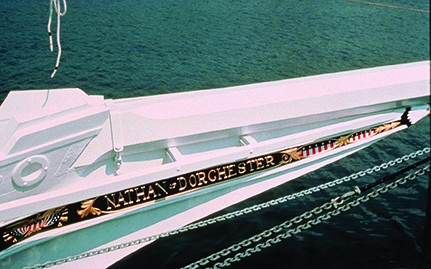 On July 4, the skipjack Nathan of Dorchester will celebrate its silver anniversary. For the past 25 years, the Nathan has taken groups of people out on the Choptank River and Chesapeake Bay teaching visitors of all ages about the ecology of the river and Bay, the oysters and a way of life on the Eastern Shore that is quickly vanishing. The Nathan has also been a floating ambassador for Cambridge, visiting ports of call up and down the Chesapeake Bay. 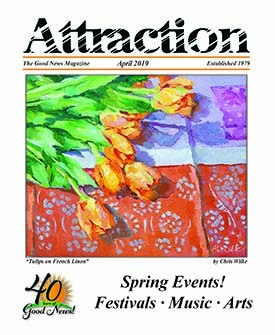 In celebration of this event, Charles Rouse, the marketing director for the Nathan, wrote four articles that highlight key stepping stones in the life of the Nathan. The first deals with the declining oyster population, and subsequent decline of the skipjacks. The second article talks about Nathan Myers and President Bush’s Thousand Points of Light, both of which were instrumental in building the Nathan. The third article talks about the actual building of the skipjack, which became a community undertaking; and the fourth article speaks of the impact the Nathan has had on the Cambridge community. These four articles give the reader an insight into the “birth of the skipjack,” and a way of life that endured for the past 100 years. The old sea captain eased his skipjack next to the wharf with a well-seasoned hand. He could almost do it blind-folded; just by getting the feel of the waves pushing against the boat and listening to the flutter of the sails. He docks the skipjack by the bucket lift – one that will soon weigh his catch of oysters and pay him his measure of his worth on this bleak day in March. “Dredging is almost done now,” he murmurs to his mates as he views the paucity of oysters culled at the end of a long and laborious day on the water. His crew would wind in the dredges, now resting on either side of the deck, over 30 times a day. Each time there seemed to be fewer live oysters. “I think this is it,” he utters sadly to no one in particular. Dredging for oysters is just about over. 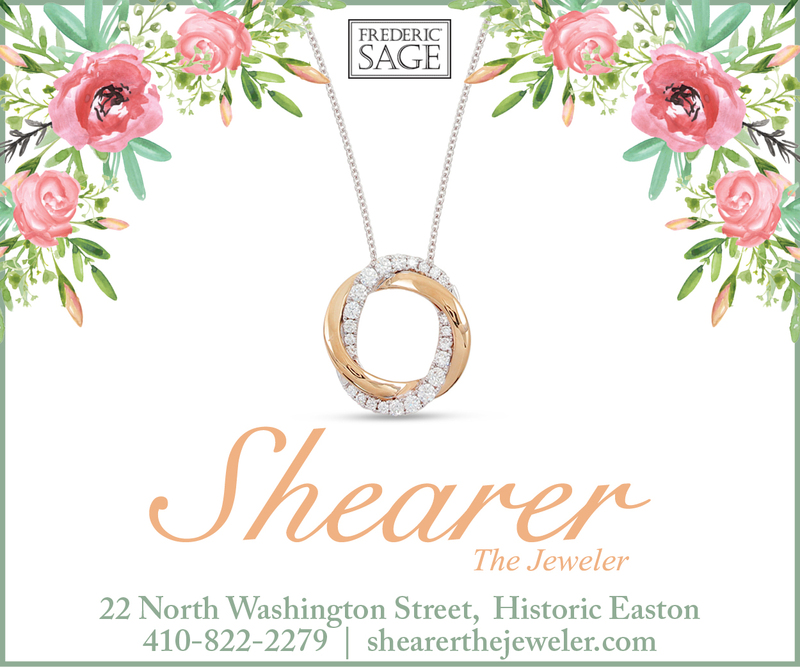 When Captain John Smith arrived on the Chesapeake Bay in 1608, the oysters were as big as a dinner plate. Nine inches across and succulent beyond description. A day’s catch could be hauled up in just a few hours, and a man could be well-fed with just a half-dozen or so. The reefs were so large that at low tide the skipper would have to post a watchman to help the steersman maneuver the vessel around them. And the reefs were so abundant that a waterman could drop a dredge almost any place in the Bay and be assured of a bountiful catch. The Bay gave up 15 million bushels of oysters a year in 1880, dredged up by over 800 skipjacks that traversed the Bay for eight months of the year. 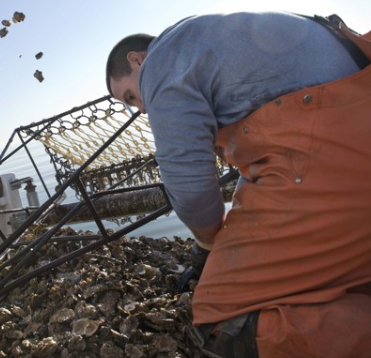 This year, however, the Bay gave up less than 80,000 bushels of oysters. Dredging profitably for oysters is just about over. “Something must be done,” cried the conservative congressmen in Annapolis. “We need to preserve the oysters, and the tradition of dredging as a way of life along the Chesapeake Bay.” Just as Margaret Mitchell said of the Old South with its charm and grace, now “Gone with the Wind” so the waterman’s way of life and the oysters that supported it will soon be “gone with the waves.” Something must be done. There were telltale signs of the Bay’s depleting supply of oysters. In 1878, Lieutinant Edward Francis Winslow conducted a major survey of the Bay’s oyster beds. He found that when dredges broke up oyster rocks, the oysters seemed to grow bigger from having more room to grow. This also increased production of oyster larvae. Once attached to a surface, such as oyster shells, the larvae become spat, which become the next generation of edibale oysters. However, his recommendations to preserve and regulate the oyster beds were rejected. That year, the live oyster take decreased by almost a half bushel per acre of oyster beds. Debate remains to this day as to the origins of the name. Some speculate it came from a name New England fisherman called the flying fish. Still others claim it is derived from an archaic English term, meaning an “inexpensive yet useful servant.” The skipjacks were inexpensive to build and easy to operate. The hull is wooden and V-shaped, with a hard chine and a square stern. To provide a stable platform when dredging, skipjacks have very low freeboard and a wide beam, averaging one third the length on deck. A centerboard is constructed in lieu of a keel. The mast is hewn from a single log, with two stays on either side, without spreaders; it is stepped toward the bow of the boat, with a small cabin. As typical in regional practice the bow features a curving longhead under the bowsprit, with carved and painted trailboards. A typical skipjack is 40 to 50 feet in length. The boats use direct link Edson worm steering gear mounted immediately forward of the transom. The dredge windlass and its motor are mounted amidships, between the mast and deckhouse. Rollers and bumpers are mounted on either side of the boat to guide the dredge line and protect the hull. Due to state laws, the boat has no motor other than for the windlass. Most skipjacks were eventually modified with stern davits to hold a dinghy or pushboat that allowed easy access to and from port. Because they were inexpensive and easy to build, most skipjacks were built in back yard of homes along the Eastern Shore of the Chesapeake. At one time, the number of skipjacks built is estimated at approximately 2,000. 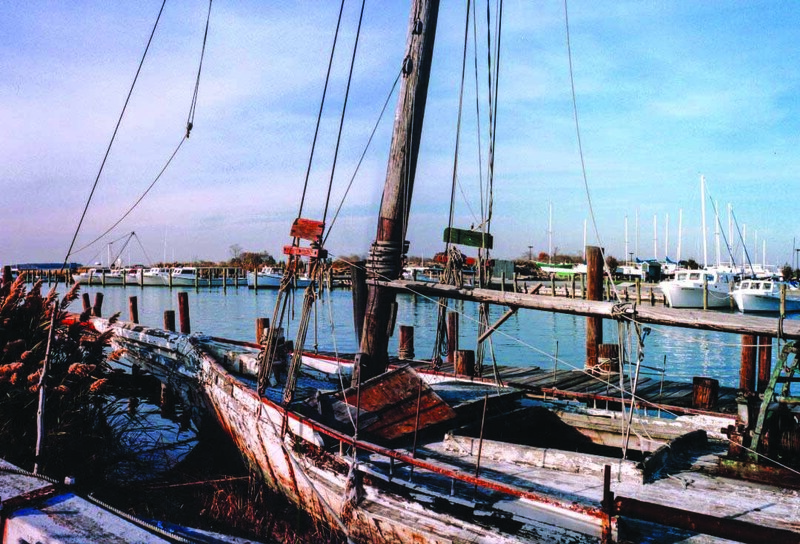 The skipjack was designated the state boat of Maryland in 1985, and is the state’s only commercial fishing fleet. However, just as the oyster harvests began to decline, so, too, did the skipjack fleet. These magnificent wooden boats were built to last about 25 to 30 years. After that, it was too expensive or too labor intensive to refurbish rotten planks or repair worn decks. Many of the old captains thought it was just not worth the effort; so the skipjacks were towed up one of the numerous creeks in the marshes of the Eastern Shore, and left to rot in the salt waters of the Bay. This skipjack, Oriole, was built by Sylvester Muir in 1905. As chronicled by Randolph George in Memoir of a Skipack, she is pictured here in 1993 at Knapps Narrows on Tilghman Island where she was abandoned. Thought to be too expensive to repair, the skipjacks were left to rot in the salt waters of the Bay. A way of life was quickly vanishing. Bone-chilling tales of captains and crew who braved the frigid waters of the Bay to earn a living were fading from memory. Historic battles fought over fishing rights and against Virginia watermen were almost lost to history, and tragic stories of vessels capsized in violent storms and hurricanes up and down the Bay grew fainter from the collected memories of watermen in towns along its shores. Packing houses, which once numbered hundreds from Baltimore to Crisfield began to decay and the trains that carried freshly packed oysters up the Delmarva Peninsula and across the country began to rust. Indeed a way of life was quickly vanishing. “Something must be done,” people said over and over again. Something would be done. Help came in the form of an itinerant tinkerer, President George W. Bush, and a dedicated group of visionaries called the “Committee of 100,” in Cambridge. Together, they pledged to do something, and a plan began to take shape to preserve and promote the great heritage of Maryland’s skipjacks. On April 6, 2019, there will be a classroom training session for potential volunteers from 10 a.m. to 12:30 p.m. at the Dorchester County Historical Society. Contact micheledrostin@gmail.com or info@skipjack-nathan.org for more details.